The Erie Canal helped define who we are as Americans. Video drama of the making of the Erie Canal and its impact on New York and the nation. Politicians and engineers consciously selected an interior route from the Hudson River directly to Lake Erie, rather than a shorter route to Lake Ontario at Oswego. The interior route helped ensure that Midwestern timber and produce would flow through New York State to market. It discouraged U.S. products from being shipped down the St. Lawrence River through Canada, which was still part of the British Empire, and diminished the risk of invasion from the north. DeWitt Clinton was the Erie Canal’s most persistent and effective promoter. A former New York State legislator, U.S. Senator, Mayor of New York City, and a member of the commission that oversaw the initial surveys for a cross-state canal that started in 1810, Clinton spearheaded the political effort to bring the canal into being. After President Thomas Jefferson declined to support use of federal funds for a canal in New York and his successor James Madison vetoed a bill that would have provided federal money for canal and road projects, Clinton worked tirelessly to garner support for the canal from a deeply divided New York State legislature. His efforts paid off, and in 1817 the first canal authorization bill passed by a narrow margin. Clinton was elected Governor later that year, just before construction of the Erie Canal started at Rome on July 4, 1817. Thereafter, construction and operation of the Erie Canal was authorized, funded, and managed by New York State. Ironically, at a time when national leaders such as John C. Calhoun were arguing strongly for federal support of internal improvements “to bind the Republic together with a perfect system of roads and canals,” the Erie and most of the waterways that followed during America’s great canal era were built with state funds under state direction. “Clinton’s Ditch” and its imitators illustrated the powerful role of state governments in the new republic. The Erie Canal ensured the status of New York City as America’s premiere seaport, commercial center, and gateway to the interior – eclipsing New Orleans, Philadelphia, Boston, and Baltimore. It helped New York become the “Empire State” – the leader in population, industry, and economic strength. Together, these effects gave New York a remarkable degree of political influence on the national scene and helped establish the United States’ place in North American affairs. Even before it was built, promoters of the Erie Canal claimed that it would “bind the Union,” reinforcing connections between the eastern seaboard and the still largely unsettled but expanding territories to the west. Echoing those claims, many historians believe that the Erie Canal had a major impact on the outcome of the American Civil War. 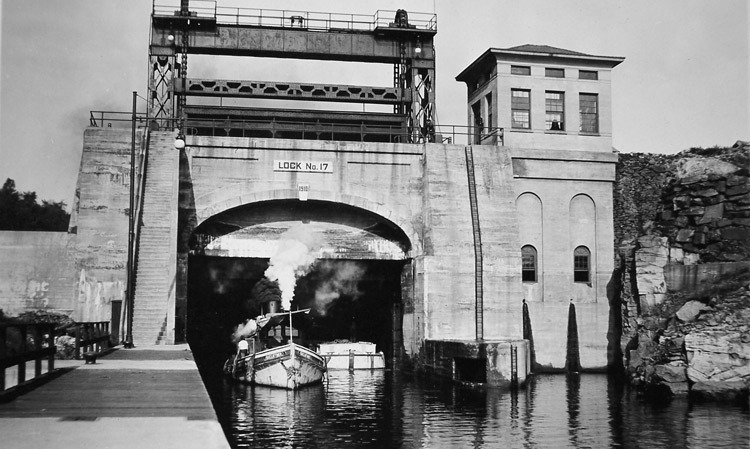 Not only did the canal play a role in transporting food and material, but it also strengthened economic and social ties between the northeastern seaboard and the Midwest. Established ties, maintained by 35 years of commerce and migration along the Erie Canal, meant that residents of Ohio, Illinois, Indiana, Michigan, Wisconsin, and Minnesota (a region historically called the “Old Northwest”) generally supported union rather than secession. If the Erie Canal had not been constructed, most of the commerce of the Midwest would have followed the Mississippi to and from New Orleans, and social, economic, and political sympathies might have taken a different form. The Canal System is listed on the National Register of Historic Places. View historic images and learn more in our gallery.